We here at The Official Wrestling Museum would like to give our condolences to Connor's family. We would also like to remember him as a true reason why wrestlers lace up their boots. Why they spend so many nights on the road to bring enjoyment into our lives. Conner was a symbol of how one person's passion can be one person's hopes and dreams and as we get older we lose touch with our dreams and these people believe in just being happy. Conner with the world not looking so clear gets to turn his hard times into something amazing by meeting is favorite wrestler and get special moments at a few events to help brighten his life. 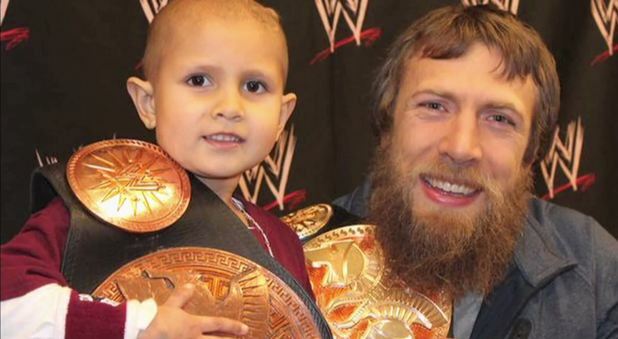 Just think Connor was 6 years old when he met Daniel Bryan and 8 years old when he unfortunately passed on. With the world not being what many would say fair to a young child he took those moments to embrace the happiness and lived out his dreams as best as he could. We all could learn alot from him. R.I.P. Connor 'The Crusher' Michalek. We will always remember you as a wrestler we all could look up too.